Shopping for sewing kit essentials can be very exciting, but with so many different gadgets and tools to choose from you wonder what you really need to get you started… What’s essential and what can wait for the days when you will be a much more competent and experienced sewist? 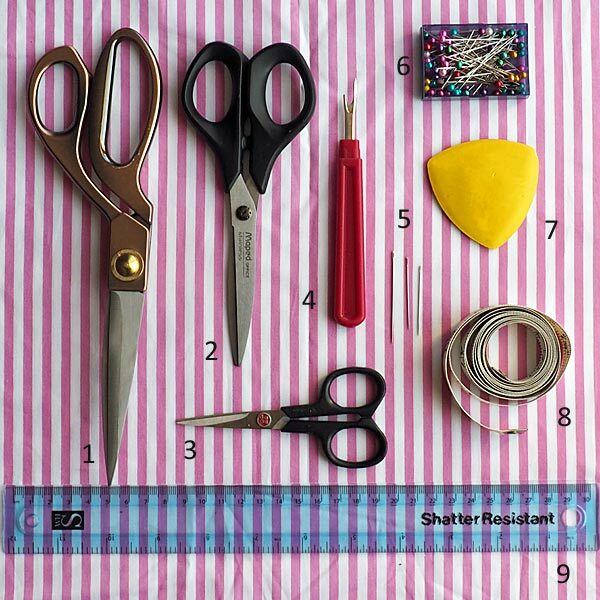 So… as a beginner sewist which are the sewing kit essentials you absolutely need in your starter kit? Well, first and most of all you will need a good pair of dressmaking scissors (1) and please read this now and have it tatooed on your forehead if you can! Guard these scissors with your life! Dressmaking scissors MUST only ever be used to cut fabric and absolutely nothing else! Cutting other materials with them will cause the blades to become blunt and the scissors to chew up your fabric rather that cut it smoothly and sharply. These scissors should be well looked after and regularly cleaned and oiled at the screw, as well as professionally sharpened about once a year if you use them regularly. Investing in a good pair of scissors is definitely worth in the long run as it will make cutting into your fabric a pleasant rather than awful experience. There are various brands of scissors to choose from, starting from affordable, mid-range ones such as Fiskars to top quality handmade ones such as Ernest Wright & Son which, starting at £40 for the cheapest pair are a real investment , but amongst the best you could ever buy! In addition to these scissors you will also need a pair of paper scissors (2) to cut your patterns with and a pair of embroidery scissors (3) or thread snips to cut threads as you sew. Your sewing kit essentials will also need to include a selection of hand-sewing needles (5), some dressmaking pins (6), some tailors chalk (7) for marking or, if you prefer you could use a vanishing fabric marker, a dressmakers measuring tape (8) and a clear straight ruler (9). If you are in London and fancy going shopping for these sewing kit essentials yourself, you could head off to William Gee in Dalston, Morplan in central London (although they also have branches in Bristol and Glasgow), John Lewis in Oxford Circus or The Crafty Sewer in Balham. William Gee and Morplan also sell their products online, so do check out their websites if you would rather shop from the comfort of your home. Thank you #sew much Elena! Recently heard of other sewing folk using soap or pencil for marking fabric – more money for fabric!